We're Hiring Pension Consultants! 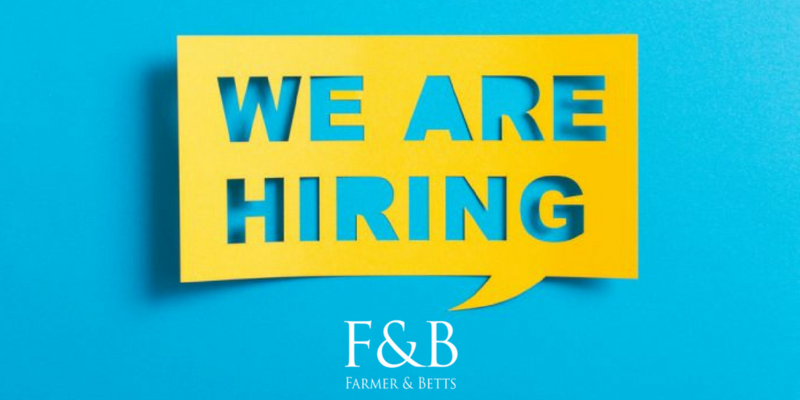 (Apply Now) | Farmer & Betts, Inc.
We're hiring experienced Pension Consultants in new territories! Do you know someone who has demonstrated success in the retirement plan industry? Invite them to apply today to join the Farmer & Betts team! Pension Consulting involves marketing to Financial Advisors and CPA’s to obtain referrals to their clients. No cold calling or marketing directly to clients is required. Our organization is well known and has a good reputation in the industry. We have a training program. We are expanding and would like to develop new territory. Pension Consultants typically set their own schedules and work 40 or more hours a week. The hours you work are primarily business hours Monday through Friday. Pension Consultants are ultimately paid commission + trail. However, new consultants begin with a draw salary (dependent on their experience and current referral network), expense allowance, and commissions. Company health insurance is also offered. The compensation is very competitive, with no ceiling on earning potential. We are considering the following territories; Atlanta, GA, Texas, Tennessee, North Carolina, St. Louis, MO and Minnesota. Typically, most clients and referral sources will be within a 1 hour drive. Pension Consultants will travel within assigned territory Tuesday through Fridays. Face-to-face service is an important part of developing referrals and servicing clients. Farmer & Betts is a growing third party pension administration firm. Our sales team is driven and energized. We have a strong culture of excellence! Founded in 1999, our company administers over 1,900 qualified retirement plans for clients throughout Washington, Oregon, Idaho, Colorado, Georgia, Illinois, Missouri, Florida and California.